In-Office Teeth Whitening: A Brighter Smile in an Hour! Drs. 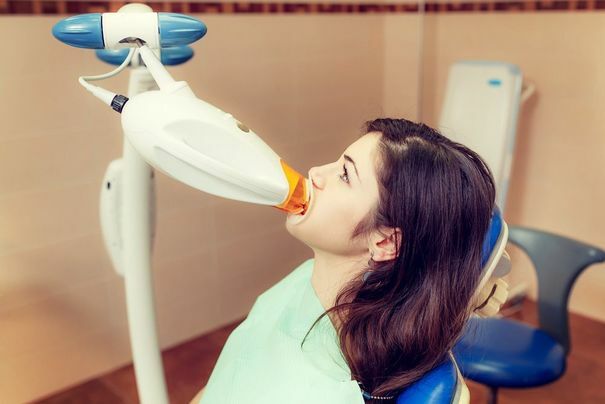 Donald Ross, DDS, David Kim DDS and Neal Shah, DDS, provide in-office teeth whitening at their Atlanta, GA, practice for patients who need fast, dramatic results. With popular, effective ZOOM!® whitening, your dentist will use peroxide-based whitening gel to break apart dental stains. The treatment involves negligible discomfort and no downtime. Best of all, in-office whitening is highly effective and, with proper care, the results can last for years. Dr. Ross, Dr. Kim or Dr. Shah will conduct a thorough consultation to determine whether in-office whitening is the right option for you. Before whitening, you will have a thorough cleaning to clear away bacteria, plaque, and tartar. When you are ready to begin treatment, your dentist or dental assistant will isolate your teeth and seal off your gum tissue with a rubber dam. This will prevent the whitening gel from touching your sensitive soft tissues. Next, your practitioner will coat your teeth with whitening gel, and may use the ZOOM!® blue light to activate the product. Once activated, oxygen molecules in the gel will penetrate the stains on your teeth and break apart the chemical bonds between them. After about fifteen minutes, your dentist or assistant will wipe off the gel and apply a new layer. He or she will repeat this process one or more times to achieve your final results. After one treatment, your smile could be up to 8 shades lighter. In-office whitening is highly effective. After one treatment, your smile could be up to 8 shades lighter. In addition, ZOOM!® in-office care is very quick, and you could enjoy outstanding results after just 45 minutes. Therefore, this treatment can be a great option if you want to brighten your smile in time for a wedding, vacation, or another upcoming event. A bright, sparkling smile can boost your overall self-confidence and take years off your face. It is a relatively cost-effective way to dramatically improve your smile, and it does not require a large investment of time. Though ZOOM!® offers dramatic results, the treatment cannot prevent stains from developing in the future. Fortunately, proper maintenance can keep your smile bright and sparkling for years. First, you should cut back on dark-colored foods and drinks. Coffee, tea, red wine, tomatoes, berries, and similar foods can leave stains on your dental enamel. When you do eat such foods, be sure to also drink water and to brush your teeth when you are done. In addition, you can undergo regular touch-ups to reduce any stains that do appear. These touch-ups can take place in our dental office. Alternatively, Dr. Ross, Dr. Kim or Dr. Shah can provide take-home whitening trays so you can perform ongoing touch-ups on your own. Are You a Candidate for In-Office Whitening? In-office whitening can significantly reduce extrinsic stains located on the surface of your teeth. These stains are the most common type of discoloration, resulting from foods, drinks, and the natural aging process. Intrinsic stains, located below the surface of your teeth, can appear because of dental infection, medications, or discolored fillings. If you have these types of stains, whitening is not a good option. However, our dentists can recommend a more suitable treatment, such as porcelain veneers or dental bonding. To learn more about the benefits of in-office whitening and to find out if it is right for you, contact our office today.